It really doesn’t get better than this folks! Dan and Laura’s wedding was a wonderland of eclectic style and mismatched décor, which was held on the 14th September 2018 at the Crab and Lobster in North Yorkshire. The venue had the perfect quirky vibe which suited their wedding vision of something a little different. I just adore Laura’s lace sleeved dress by WWW faves Graces Loves Lace, which was oh so bohemian beautiful. Dan and the gents looked perfect in brown tweed suits and flat caps while the bridesmaids wore long sage green dresses. So much style! I also have to rave about the blooms here today. I am head over heels for the orange and pink bouquets featuring dahlias and blue thistles. Just gorgeous. 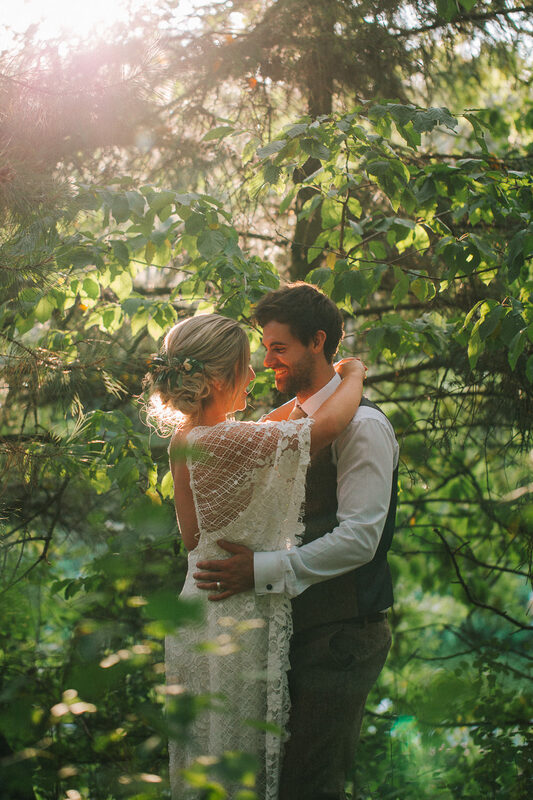 Huge thanks goes to A Little Picture for sharing these sublime images, I especially love the portraits of Dan and Laura in the trees. It was our 5th year anniversary. We are both wannabe ?ramblers? and so were hiking up Froggatt Edge in the Peak District. Dan proposed at the top – we then got lost on the way down and turned into rookie rock climbers too that day!